Thanks to the University of California-Santa Barbara Cylinder Audio Archive, you can now download or stream a digital collection of more than 10,000 cylinder recordings. "This searchable database," says UCSB, "features all types of recordings made from the late 1800s to early 1900s, including popular songs, vaudeville acts, classical and operatic music, comedic monologues, ethnic and foreign recordings, speeches and readings." 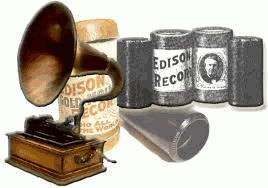 You can also find in the archive a number of "personal recordings," or "home wax recordings," made by everyday people at home (as opposed to by record companies).